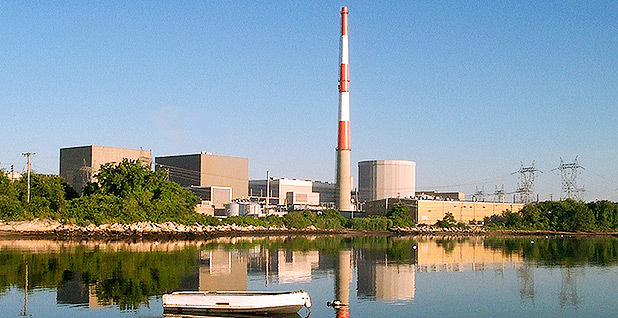 The Millstone Nuclear Power Station in New London, Conn. Photo by Dominion Energy, courtesy of the NRC/Flickr. Connecticut is the latest state to debate a measure that would aid existing nuclear plants, following on the heels of subsidy programs approved in Illinois and New York. The Connecticut General Assembly Energy and Technology Committee on Tuesday held a hearing on S.B. 106. While specific language hasn't been filed, it's expected to be similar to a bill last year that would have allowed Dominion's Millstone Nuclear Power Station to bypass the wholesale market and sell energy and capacity directly to utilities if state officials determine that doing so is in the interest of ratepayers and the environment. S.B. 344 was approved by the Connecticut Senate last spring by a vote of 33-3. But the legislation never made it to a vote in the House. Now the issue is teed up again with nuclear industry supporters squaring off with rival power producers and other opponents. While the Trump administration has expressed some support for preserving nuclear capacity, state-level programs are a better bet than gridlocked Washington to help an industry buffeted by low natural gas prices, slack demand and increasing penetration of subsidized renewable energy, industry officials said. "It's not news that you can get things done easier and more quickly at the states," said Christine Csizmadia, director of state governmental affairs and advocacy for the Washington-based Nuclear Energy Institute. Csizmadia said being able to point to recent policy victories in New York and Illinois is a tremendous help in working with other states and creates a "snowball effect." Joe Dominguez, executive vice president of governmental and regulatory affairs and public policy at Chicago-based Exelon Corp., said discussions about preserving nuclear plants are already underway in a few other states — Ohio, Pennsylvania and New Jersey. "All the states are states that understand the value of the nuclear plants and want to keep these plants operational," Dominguez said yesterday during Exelon's quarterly conference call. "The level of discussion is at different stages." In Pennsylvania, where the company owns three nuclear plants, discussions are still in the early stages, Dominguez said. He said it's premature to speculate what kind of legislation might be proposed. "Historically, what we've done is we've begun the discussion, and the first stage of the discussion is establishing a recognition that nuclear is the lowest-cost and most reliable zero-carbon option for our customers," he said. "That's where we are in Pennsylvania." Ultimately, legislative solutions could be similar to the zero-emission credit (ZEC) programs in New York and Illinois (Energywire, Dec. 2, 2016). Or they could involve including nuclear plants as a qualifying resource in renewable portfolio standards. "I think each state needs to find its own solution," NEI's Csizmadia said. As certain as it is that the nuclear industry will continue to lobby for state-level support of existing reactors, the Electric Power Supply Association, a group representing competitive generators such as Dynegy Inc. and NRG Energy Inc., will be on the other side of the table. EPSA has fought the nuclear subsidy programs in the courts and in proceedings before the Federal Energy Regulatory Commission, and will continue to be active in state-level debates, said John Shelk, the group's executive director. Unlike Illinois, where Exelon said its plants were losing money and on the brink of closure, Shelk said there's no evidence that nuclear plants in Connecticut or other states are bleeding red ink. The Millstone plant, in fact, is committed to run through 2020 under a contract with ISO New England Inc.
"There's absolutely no indication that any one of those plants is in financial jeopardy," he said. While it will continue to push for state-level support, the nuclear industry is also hopeful for assistance from the Trump administration. Exelon CEO Chris Crane said the company and NEI have only begun to have a dialogue with the administration. "There haven't been any concrete conversations; just preliminary recognition of what's going on in the marketplace and the need to maintain diverse power sources," Crane said. The nuclear industry could be helped by a carbon tax — the centerpiece of a proposal put forward yesterday by a group of prominent Republicans to reduce greenhouse gas emissions. The NEI said it was too early to comment on that plan. In the meantime, the industry will also be busy defending the New York and Illinois ZEC programs against challenges in federal court and at FERC (Energywire, Jan. 11). Exelon has filed a motion to dismiss a lawsuit brought against the state of New York, and the company believes a victory there will be meaningful in case there's a legal challenge to the ZEC program in Illinois, Dominguez said.